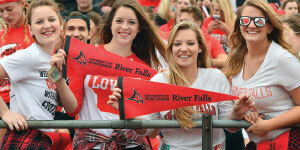 Opportunities abound at theUniversity of Wisconsin–RiverFalls. Offering hands-on learning, personal attention, and leadership opportunities, students will receive the skills needed for lifelong success in a friendly and supportive community.Just 30 minutes from Minneapolis–St. Paul, Minnesota, students truly have the best of both worlds: the support and inclusivity of a small town with easy access to the amenities of a big city. We are committed to providing you with an outstanding education anddynamic learning experiences—without breaking the bank. 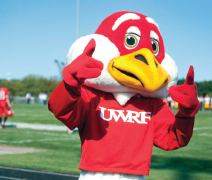 UWRF offersa Scholarship Guarantee program that grants an automatic scholarship to new freshmen who demonstrate strong academic potential (22+ ACT/1100+ SAT and rank in the top 40%). With over70 areas of study in the areas of agriculture, business, science, and the arts, you will have plenty of opportunity to pursue your purpose and passion in life. Don’t just study scientific breakthroughs—make them. Our commitment to undergraduate research andscholarly and creative activity extends to all fields of study. Engage with ideas, people, cultures, and places beyond campus with dynamic semester-long international programs at a price comparable to on-campus tuition and housing. Our scholars programs are designed to provide you with the resources and support you need to become a leader in your field.